CEPR hosted two events with Pablo Solón Romero Oroza, Plenipotentiary Representative for Integration and Trade Issues, Bolivian Ministry of Foreign Relations. CEPR sponsored a press breakfast on May 31 and a public presentation on June 1, on foreign investment in Bolivia. Much of the discussion focused on Bolivia’s precedent-setting move to withdraw from the investment dispute settlement arm of the World Bank, the International Center for the Settlement of Investment Disputes (ICSID). CEPR co-Director Mark Weisbrot introduced Ambassador Solón at both events and also provided background information on some of the issues. The right of investors to sue governments directly, including for governmental regulatory actions that may diminish their profits, is a recent phenomenon, which the vast majority of such cases having been filed in just the last five years. It was a significant shift of power from governments to corporations, and one that some of the new democracies in Latin America seek to reverse, as they reclaim control over their natural resources and respond to the demands of their voters. Among those attending the press breakfast were reporters from the Wall Street Journal, Reuters, Associated Press, Washington Trade Daily, the Spanish News Agency EFE, and by phone from South America, Bloomberg News and CNN. Pablo Solón Romero Oroza (at right) sits down with journalists to discuss the investment climate in Bolivia, May 31, 2007. 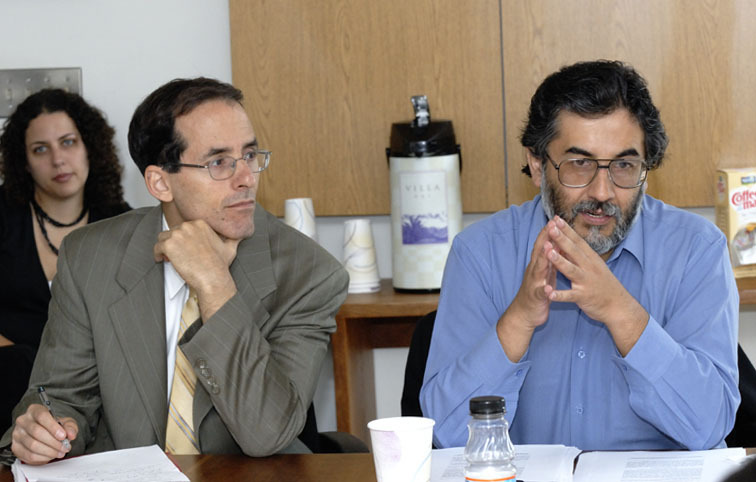 At left is CEPR Co-Director Mark Weisbrot. Mark Weisbrot discusses the lessons learned from the Asian Financial Crisis, May 16, 2007. John Schmitt moderates a panel with Nelson Barbosa from the Brazilian Ministry of Finance; Ilene Grabel from the University of Denver; and Worapot Manupipatpong of ASEAN. Audio and video files are now available for two events on the IMF and World Bank hosted by the Center for Economic and Policy Research. See: Five Years of Extraordinary Economic Growth and Poverty Reduction in Argentina (Felisa Josefina Miceli and Mark Weisbrot) and Global Imbalances, Power Shifts and the Future of Multilateralism (Joseph Stiglitz, José Antonio Ocampo and Mark Weisbrot). Edmund Andrews, José Antonio Ocampo, Mark Weisbrot and Joseph Stiglitz respond to audience questions. The Bridging the Gaps project is picking up steam in New York. Working with the Fiscal Policy Institute (FPI), Heather Boushey and Liz Chimienti presented the project's research goals and received helpful feedback from over 30 researchers and advocates in Albany and New York City. In addition, FPI's Deputy Director James Parrott arranged for Heather and Liz to brief the staff of New York City's Center for Economic Opportunity on the project — and the possibility of generating specific data for New York City. Given the large population of city, Bridging the Gaps researchers believe it may be feasible to get that level of detail (with relatively large standard errors). Over the next few weeks, the Bridging the Gaps team will incorporate recent feedback and finalize the New York state research. The Fiscal Policy Institute will work with its allies to determine when and how the New York state report will be released.